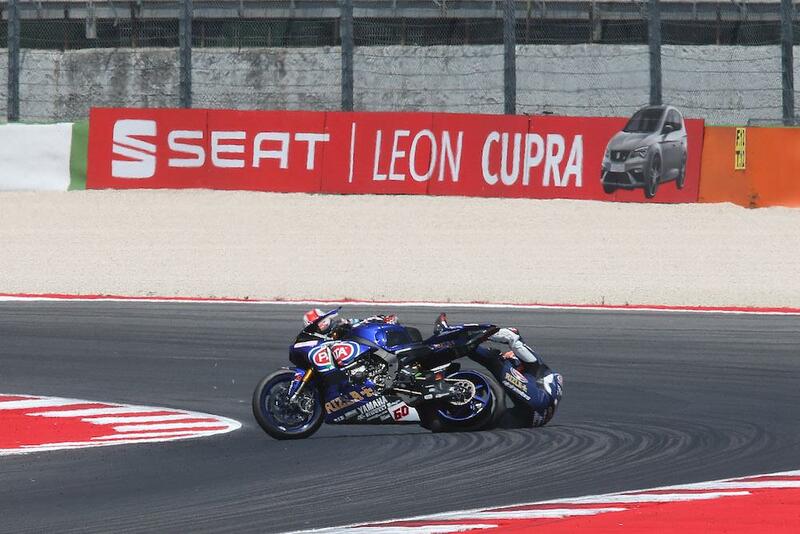 Michael van der Mark’s victory challenge in today’s opening World Superbike race in Misano was thwarted by a hole in his tyre, Pirelli have confirmed. The Dutchman rode a valiant race, leading from the early stages until eight laps to go when he would dramatically crash out of the lead after losing the rear. With his rear tyre off its wheel rim before van der Mark’s YZF-R1 had even hit the ground, it was clear from the off that the crash was no fault of his own. The incident raised concerns in the paddock given the incident comes just two races after Jonathan Rea was also catapulted from his machine due to a tyre failure at Donington Park. However, Pirelli’s Motorsport boss Giorgio Barbier has confirmed the damage sustained to van der Mark’s rear tyre is different to Rea’s and while the duo were both using the SC0 softer rear, Rea was using a development compound whereas van der Mark used the standard option. “Just a few hours after the race, the elements we have available are obviously not enough to allow us to provide a structured and complete explanation of what happened to Michael Van Der Mark's rear tyre,” Barbier said.